As the year comes to an end, we would like to celebrate with the entire World Affairs Council. 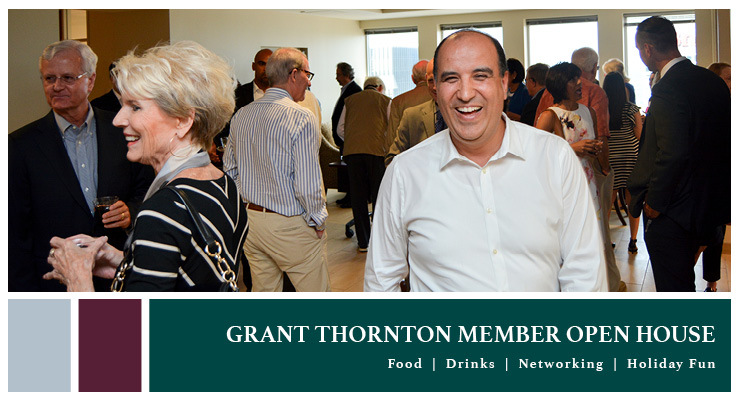 Join us for the annual holiday Member Open House on Thursday, December 13, graciously sponsored by Grant Thornton LLP. We welcome you to our home on the 42nd floor of the Republic Center in downtown Dallas. Look forward to a winter’s night of free flowing conversation, food, and refreshments. Come network with fellow members, board members, guests, and staff. You’re welcome to wear a festive holiday sweater, as we look back on our favorite WAC memories from this past year. It’s the season to reconnect with old friends and meet new ones, who share your passion for international affairs. Reserve a spot today for our 2018 Grant Thornton Members Open House. The festivities are free, and parking is discounted. Hope to see you there!